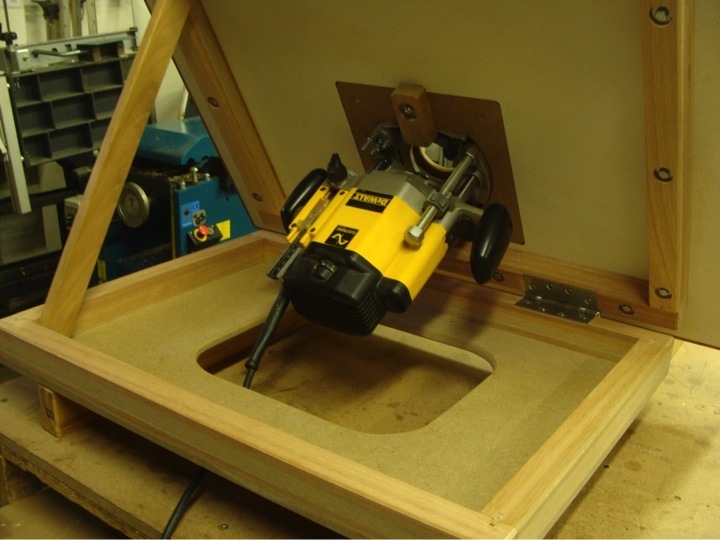 There are very few things in a workshop that match the versatility and functionality of a good router table. My first router table was fitted with a 1/2" ELU MOF 177 router. I wince when I recollect the time I spent down on my knees on a hard concrete floor struggling to change bits and adjust the bit height. I wince when I recollect the bruised and grazed knuckles. When Triton introduced their 2000W router with above-table bit changing some ten years ago I immediately swopped even though the ELU was still in prime condition. I have used Triton routers in my router tables ever since and today have the added benefit of above-table height adjustment. 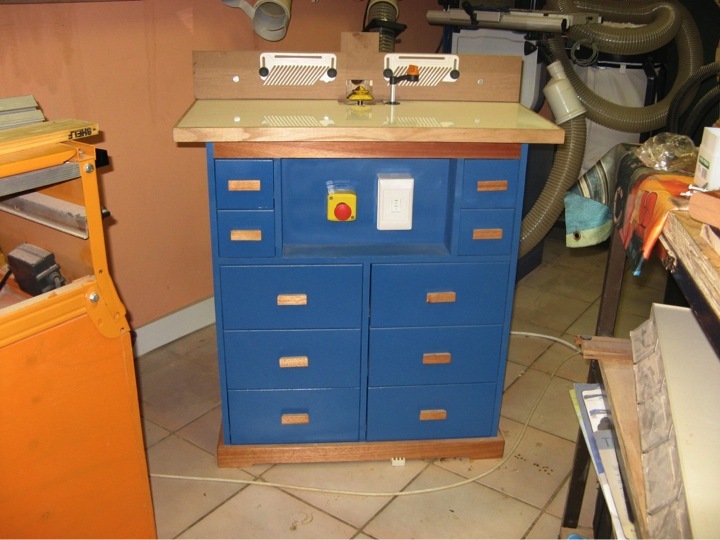 In 2009 I helped one of my students build a router table (the blue one on the right) for his Triton 2000 router. A number of woodworkers liked the photos and comissioned me to build a router table for them. I shouln't say router table - I should say router table top, fence and accessories. The building of the stand / cabinet was left to them. In March 2012 I decided that the shoemaker's child had gone barefoot for long enough and I built myself a new router table that boasted a cabinet with drawers and cupboards (the second photo). I now had a demo model, not just photos, and I sold more router table packages. I make the packages in batches of five in order to use up a full roll of Formica. I make two or three batches a year. Most of them have been for Triton routers. Theoretically I can fit any make/model of router. In practice I must find a satisfactory solution to bit changing and bit height adjustment. 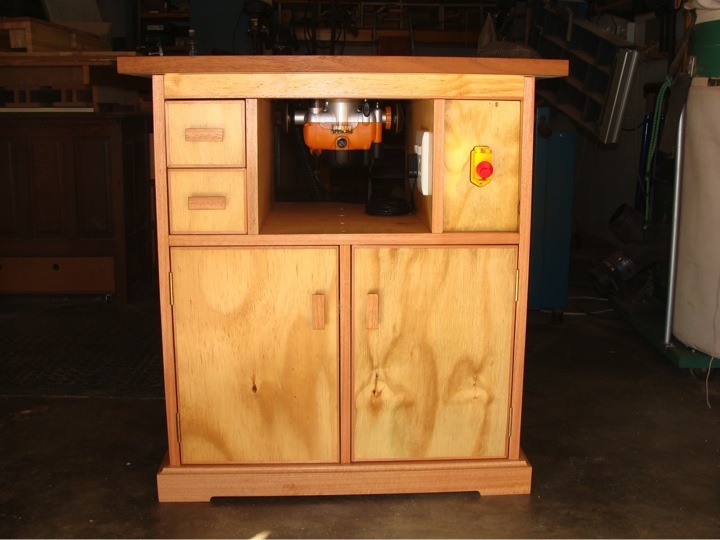 One of the solutions I have used is a tilting-top router table. I have used this with a DeWalt and other routers (the third photo). I will supply a router table top, fence and accessories as per the following specifications and prices. You build the stand: welded square tube, bolted wooden legs and struts or an enclosed cabinet with drawers and/or cupboards from plywood, MDF or chipboard. Guidance on sizes will be provided.